Preparing for adoption by buying hundreds of outfits seems a little silly to this father. But he soon finds himself swept up in the excitement. Although we know that family and friends will give us truckloads of baby clothes when our daughter finally arrives, my wife, Danielle, and her sister, Dominique, can’t resist doing some shopping while we’re preparing for adoption. I go along, but I am puzzled by their enthusiasm. They excitedly show outfits to each other, as if the clothing matters — the baby isn’t going to know what she’s wearing, and she’s probably just going to drool and puke all over it anyway. It occurs to me that a child sometimes is an excuse to buy clothes. Listen to most conversations about a baby, and you’ll discover they are mostly talking about what the baby is wearing. People oooh and ahhh, not over the baby’s physical attributes, but rather over the cute ruffles, the precious buttons shaped like flowers, the adorable flounces, and the darling ducks waddling along the trim. When someone says, “Oh, isn’t he/she cute?” let’s face it — it’s about the fashion. As Danielle and Dominique eagerly examine different ensembles, I feel like the one person who can’t see one of those 1990s magic-eye optical illusions while everyone else marvels. Then it happens. 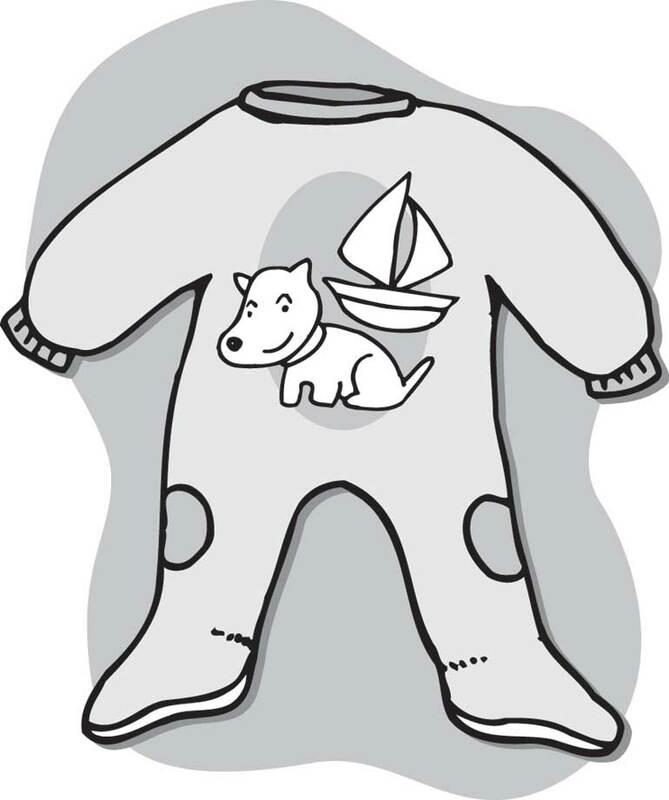 On one rack, I notice a dark-blue onesie with a smiling dog and an orange boat on the chest. Something stirs deep within me. When I visit an art museum, I expect to be moved by great works. I anticipate a sense of revelation, an upwelling of joy, a transforming experience. What I hope for, in short, is exactly what I am feeling while looking at this onesie. I know immediately that my child will look perfect in it. But, after mocking Danielle and Dominique all morning, I am reluctant to reveal my enthusiasm about it. So I strategically hang it on a display rack where the sisters will surely see it. My decisive spouse gives the onesie a quick glance: “Too big. It’s probably for a 1-year-old. And right now we need things for the winter.” She moves on. It’s the wrong size. It’s for the wrong season. It will sit in the drawer for a year. I should put it back on the rack. But I can’t. Instead, I carry it to a different aisle, where I mull over what to do. Yes, it would be an impractical purchase, but I don’t care. I want it for my daughter. I am tempted to buy it on my own, but the store is small and the women will see me. An idea comes to me in a flash, and I begin to gather up what they have put in the cart. “What are you doing?” Danielle asks. Danielle gives me an appraising look. What am I talking about? I’m the One-Trip King. Then she spots the telltale blue sleeve. “What’s this?” She extracts the outfit I have tried to bury under a mound of other clothes. She could have gloated, she could have smirked. Instead, Danielle gives me a sympathetic look and puts the onesie in the cart. Is It Adoption, or Is It Life?